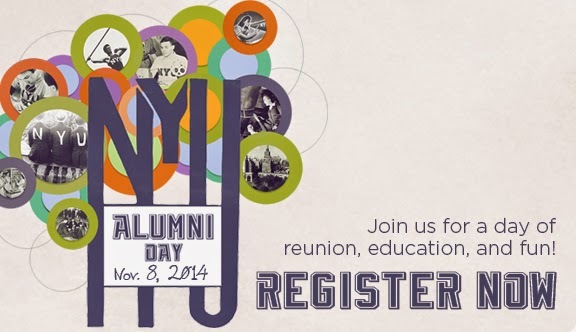 NYU Arts and Science Alumni Blog: Join Us This Weekend for NYU Alumni Day! As we prepare to welcome thousands of NYU alumni back to campus this weekend, we wanted to highlight some of the Arts and Science specific programming taking place on Saturday. Below are descriptions for our programs including the Dean's Luncheons. We look forward to seeing many of you on campus this weekend. Are you a member of the Classes of 2004, 2009, or 2013? If so, join us on Friday, November 7, when we'll celebrate the ten, five, and one year anniversary classes at Avenue Nightclub! Over drinks and dancing, you’ll meet new friends and reconnect with classmates, all while establishing a lifelong tradition that you will continue to enjoy in years to come. $20 registration includes full open bar, hors d'oeuvres, and many other exciting surprises. Get your taste buds ready for a journey they won't forget. Join Rachel Meyer, a plant evolutionary biologist for this workshop, which will explore the diversity of ways aroma and flavor are perceived, and relate them to the latest scientific research as well as cultural practices. Join Dean G. Gabrielle Starr and fellow alumni for lunch and the presentation of the College Alumni Association's 2014 Alumni Achievement Award to Dr. Stanley Plotkin (ARTS '52), Emeritus Professor of the University of Pennsylvania and Executive Advisor to Sanofi Pasteur. An esteemed physician, Dr. Plotkin developed the rubella vaccine now in standard use throughout the world and has worked extensively on the development and application of other vaccines. Join Dean Lauren Benton and fellow alumni for lunch and the presentation of the 2014 GSAS Distinguished Alumni Award to David Goldhill (GSAS '95), President and CEO of the Game Show Network and author of Catastrophic Care: How American Health Care Killed My Father--and How We Can Fix It. The lunch will also feature student research presentations. Global Liberal Studies graduates are invited to reconnect with Dean Fred Schwarzbach, GLS staff and faculty, and fellow alumni. This program is open to GLS alumni only. Closely related to the Italian divina, or divine, the diva is timeless, a marker of high culture and high art, and a symbol of Italian identity. Join CAS Instructor Valerie Hoagland to discover key moments in the history of the Italian diva, from the Renaissance to the mid-twentieth century, in an effort to understand her role as cultural protagonist across temporal and artistic boundaries. Lastly, if you find yourself on campus with some time to spare, stop into the Jeffrey S. Gould Welcome Center (50 West 4th Street) where digital versions of the University Heights, Washington Square College and CAS yearbooks are now available for viewing on the computers in the lobby. The yearbooks span in time from the first Heights yearbook in the late 1800's to 2005.